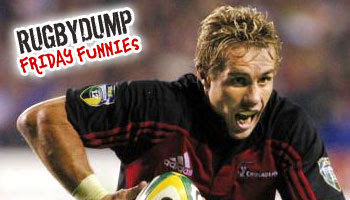 It's not the first time that former All Black Justin Marshall has made it into our Friday Funnies slot. He's single handedly featured in more Friday laughs than any other player. I don't know why that is, but maybe it goes to show what a long and eventful career he's had. This clip is from the Super 12 in 2005, when burly Brumbies loose forward Owen Finegan helped Justin Marshall on his way as he stumbled out into touch after being ankle tapped. Marshall, who was heading for the advertising boards and was off balance, took it upon himself to dive over the boards, rather than collide with them. The result was pretty spectacular and despite Finegan perhaps shoving him when he was already out, was well handled by both players. Phil Kearns, quick witted as ever, summed up Marshall's thoughts nicely with his description of the Wallaby flanker. I remember that! Man Owen Finegan was a beast of a man. Huge, slow, but great hands and somehow always played well for the Brumbies and Wallabies. Marshall, good to see him react like that. Some players would have got all aggro. Baygon can deal with most pests, but unfortunately not big scary flankers such as Finegan. haha. This is brilliant. Up,up and away! Hahaha love Marshall. I bet Finegan wouldn't have minded being carded either as the shove was probably very satisying.